I dont really use the fireplace that much, and I for sure don't like cleaning up the soot after a log has been burned. I was visiting a family friend's house and grabbed the basics of this idea from her setup. Get some Candles of different heights. I prefer them to be the same look, so I grabbed a bunch from the same brand and color from a craft store. Get some ribbons. Once again I prefere them to have the same look, so I used only one ream of ribbon I bought at Costco so it was both cheap and came with a lot. Wrap the ribbons around the base of the candles. This way if you want to occasionally light the candles you wont burn off the ribbons. Use the Pins to secure the ribbon to the candle. The metal pins won't burn if you accidently burn down the candle. Arrage the candles in the fireplace, pinned side facing the back. I like it where the different heights are mixed together, but feel free to put it any pattern that you find pleasing. 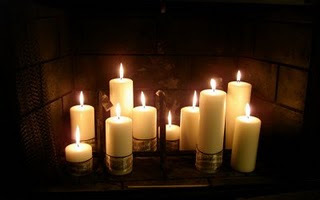 Now on a Cozy night you can relax behind the fireplace and enjoy the glowing embers of the candles.